Tandridge Canoe and Kayak Club (TCKC) is a Junior Club affiliated to British Canoeing. Our Membership Form and other club documents can be found here. The best way to progress is to participate regularly. 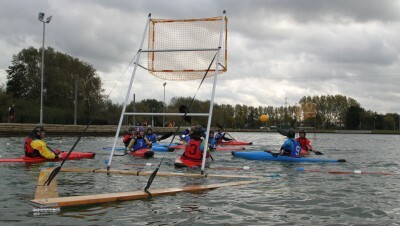 TCKC runs a canoe polo league for complete beginners and improvers (School Years 7 and above), which is a safe and enjoyable way to quickly pick up kayaking skills. TCKC has links with other local clubs and we can help members link with qualified coaches in all canoe and kayak disciplines, as well as loan boats, paddles and other necessary equipment. Once you have mastered the basic skills, you can have a go at many different types of canoeing such as slalom, river expeditions, freestyle and white water adventures. There is something for everyone – those who love teamwork, those who enjoy solitude, those who wonder at nature and those who are hooked on adrenaline and many of us who love all of those things. This can lead you to all parts of the UK and indeed the globe, forging lasting friendships and giving you amazing experiences of our beautiful natural world that many people will only ever see on film. The British Canoeing website Link to www.britishcanoeing.org.uk/go-canoeing/getting-started-1#getting-started gives loads of information about the many different types of paddle sport and how juniors and adults can get involved.